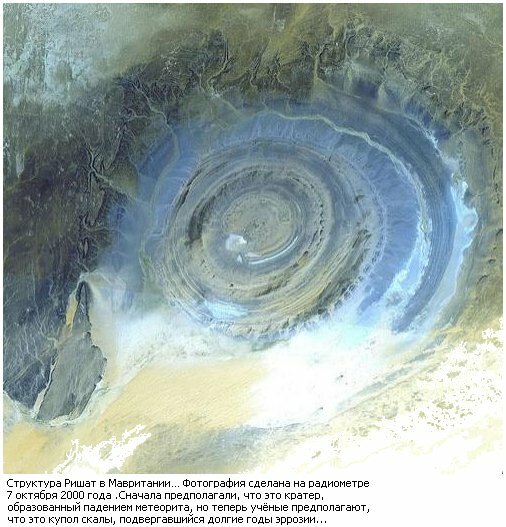 The bull's-eye target pattern of the Richat structure on the barren Gres de Chinguetti Plateau in the Adrar region of central Mauritania is an eye-catching feature when seen from space, as is evident in the color Plate photograph taken looking south from the 17th Shuttle mission. Sand has drifted northward and encroaches on part of the southern half of the 38-km wide structure. The Makteir desert abuts the plateau to the north Although reminiscent of multiringed impact structures on the Moon, Mercury, and Mars, field and laboratory evidence suggests that the Richat structure is a dome of endogenic origin. Richat, slightly elliptical and with its long axis oriented northeast, lies in a depression in which drainage is annular and radial and topographic relief is about 100 m. The strata dip outward, so that weathering and erosion of the alternating resistant and nonresistant Late Precambrian and Early Paleozoic rocks have produced a series of inward-facing cuestas. Quartzite forms the resistant circular ridges, and less resistant rocks underlie the intervening annular depressions, some of which contain seasonal lakes. The center of the structure, the Guelb er Richat exposes flat-lying limestone and some meta-arkose surrounded by a massive ridge of chert and chert breccia. The overlying part of the stratigraphic section, well exposed outward in the dome, consists of Upper Precambrian/Lower Paleozoic shelf facies rocks. The quaquaversal dip of the beds increases inward 20 to 25'; locally, dips are as great as 35'. Some minor radial and tangential faults occur in the outer parts of the structure. The north part of the structure is cut by a fault system oriented N30'E that appears to be unrelated to the formation of the dome. Reconstruction of the eroded beds of the structure suggests that they were uplifted 3 to 4 km to form the dome. Reconnaissance gravity data do not support the presence at a reasonable depth of an igneous or diapiric intrusive mass nor do they suggest the presence of low-density breccia layers characteristic of impact structures. However, deep erosion could have removed the brecciated lens. Thus, the gravity data neither confirm nor preclude an impact origin for the structure. Dolerite sills and dikes crop out at several localities within the structure. Associated analcime-rich rock has been interpreted by some to be the result of hydrothermal alteration of rhyolite sills and dikes. No evidence of volcanic activity exists at Richat. Dips of strata are relatively gentle; strata are even flat-lying at the center of the structure. Nowhere are beds severely disrupted and contorted. Although breccia is abundant in the structure, the breccia does not have the characteristics of that produced by impact. Injection breccia and pseudotachylyte-like material, shatter cones, and other shock-metamorphic effects have not been identified. The coesite reported from the rocks of the structure is almost certainly barite that was misidentified (Fudali, 1969). An unrealistic amount of erosion would be needed if Richat were an impact structure in order to remove shock-metamorphic effects. Studies elsewhere have indicated that severe effects extend downward below the base of a typical impact crater to about one-fifth its diameter; less severe shock-metamorphic effects extend even deeper. At Richat, then, detectable shock-metamorphic effects might be expected to extend to a depth of perhaps 10 km. The fact that none is observed in the rocks of the structure argues for at least 10 km of erosion if, in fact, Richat is an impact structure. Geologic history of the region does not allow the possibility of that degree of erosion nor does the structure itself show evidence of secondary uplift or deformation, or both. Reconstruction of the beds suggests a maximum uparching of 3 to 4 km, which is a reasonable upper limit to the amount of erosion that has occurred at Richat. The proximity of Aouelloul and Richat is coincidental; they are of significantly different ages. Aouelloul, a small bowl-shaped crater, is probably of Quaternary age, whereas Richat is an ancient structure that has undergone significant planation. 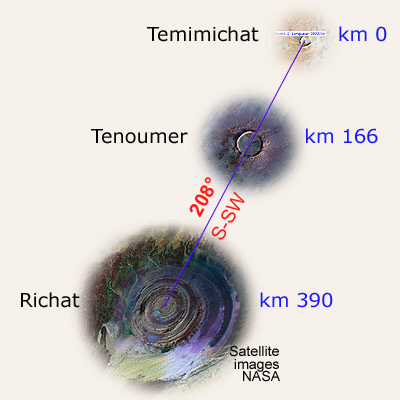 Semsiyat dome , 50 km west-southwest of Richat and centered at latitude 210'N and longitude 1105'W, has a diameter of 5 km. Although the style of deformation is similar to that of Richat, Semsiyat is barely detectable on the ground. The structure lies on the Chinguetti Plateau and has only a few meters of topographic relief. Strata dip so slightly that field measurement is difficult. Exposures are poor, and the rocks are extremely weathered. 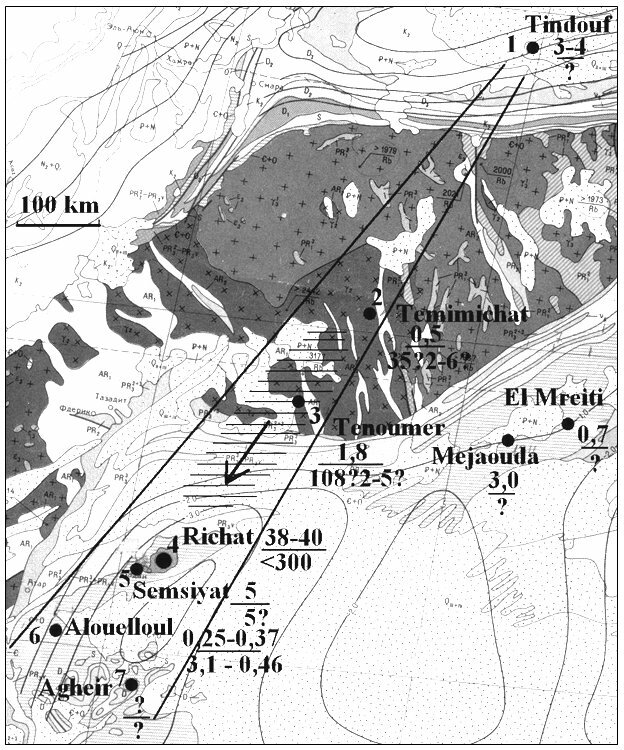 No evidence of shock metamorphism has been discovered at Semsiyat; like Richat, it is believed to be a dome of endogenic origin (Dietz et al., 1967). (GCW: J. R. Underwood). Geomorphology from Space : 1986; NASA publication edited by Nicholas M. Short, Sr. and Robert W. Blair, Jr.